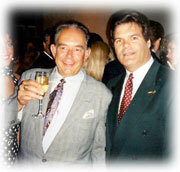 Notorious Lifestyles of the Rich and Famous host Robin Leach with E.L., who helped the show produce many segments. 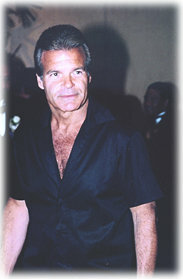 Edward Lozzi arrives at the Nosotros Awards, Beverly Hilton Hotel, Beverly Hills, July 2001. Edward Paul Lozzi is a publicity consultant who leads the firm of Edward Lozzi and Associates in Beverly Hills and New York City. During his early 20's, he worked in the mailroom of the original Rogers & Cowan Public Relations firm and was formerly an office manager of the Public Information Network before founding his own company in 1979. 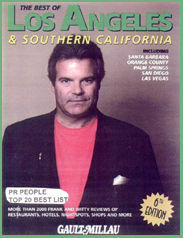 Edward Lozzi has provided publicity services for famous professionals, including Jon Voight, Milton Berle, Larry Hagman, Rudy Vallee, Bo Hopkins, Oscar-winning actress Shirley Jones, Marty Ingels, legendary actor and body builder Lou Ferrigno, Elaine Young (Beverly Hills' "Realtor to the Stars"), Renée Taylor (star of TV's "The Nanny"), recording artist Alice Cooper, talk show "memory expert" and author Arthur Bornstein, actress Tina Louise ("Ginger" of TV's "Gilligan's Island"), custom car designer George Barris, heart surgeon Dr. Christiaan Barnard, David Lee Roth and his father, surgeon Nathan Roth, Zsa Zsa Gabor, and many motion picture and television production companies. 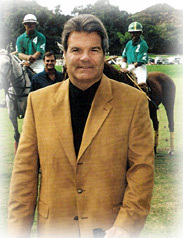 He has provided these promotional services for corporate clients such as Laker Airways, The Hartford Insurance Companies, Lloyds of London, the Winter Park Ski Celebrity Events in Denver, Colorado, Chasen's Restaurant in Los Angeles, the estate of painter Alberto Vargas, attorney Melvin Belli, the U. S. Marshals' Association, the creator of Retin-A, Dr. James Fulton, the Martin Scorsese Film Preservation Foundation's Night of 100 Stars Annual Oscar Gala, the Academy of Science Fiction, Fantasy & Horror Films' Annual Saturn Awards ceremonies, and exclusive representation of Elvis Presley Cosmetics Enterprises. 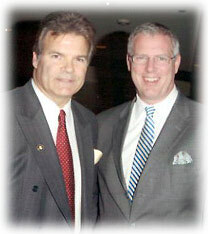 Mr. Lozzi has provided media consulting services for many motion pictures and television shows, as well as famous high-profile court cases such as the OJ Simpson trial, Pietra Thornton's divorce from Billy Bob Thornton, tobacco litigation, and the Robert Blake and Phil Spector murder cases. In the latter case, Lozzi represented film & TV actress Lana Clarkson, murdered by infamous music producer Phil Spector, who was charged with her murder. Lozzi's firm currently represents approximately 16 to 20 law firms handling criminal, divorce, entertainment, and serious personal injury litigation. Mr. Lozzi is a political media consultant and provides his expertise to government officials, political candidates, and military organizations. His experience includes appointments and consultant assignments for the White House Press Advance Office, members of Congress, Presidential staff appointees, and Press Secretaries in the executive and Congressional branches. Mr. Lozzi was educated at DePaul High School in Wayne, New Jersey, the Delbarton School in Morristown, New Jersey, New York University's College of Insurance, and the Harvard Graduate Program for Advanced Studies in Management School of Business Administration. Mr. Lozzi also played football for the University of Tennessee's ALL-SEC and AP/UPI championship football team as an undergraduate. 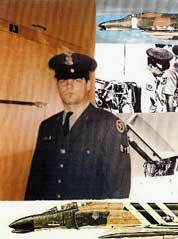 At UT, in 1968 during the Viet Nam war, Lozzi became an Air Force Cadet in the Reserved Officer Training Center F-4 Flight Training Center at McGee Tyson Air Force Base in Knoxville Tennessee. Before transfering to Hollywood, he held positions as a corporate aviation and risk management insurance underwriter for the Hartford Insurance Companies and a special broker for Lloyds of London. He was also vice president of a real estate development corporation on the east coast: The Rhodes Corporation. He was a member of the advisory board of directors of The Alexander Hamilton Savings & Loan Association. He is the son of the late Virgil Paul Lozzi, former Big Band saxophone star and real estate entrepreneur. Lozzi is also the grandson of the Honorable Raymond L. Rhodes, cabinet member Controller of Customs for former president Dwight D. Eisenhower. Mr. Lozzi is a guest commentator in the Los Angeles studios of CNN, and has appeared as a guest on national television and radio news & talk shows, including Celebrity Justice, Catherine Crier,CNN's Nancy Grace, MSNBC with Rita Cosby and Diane Dimond, USA Today, Court TV News, "The Late Show with David Letterman" (CBS), "The Today Show" (NBC), MSNBC, C-NBC News, Fox News Channel, "Entertainment Tonight", "Extra", "E! Entertainment Television", The Maury Povich Show", "Geraldo", and on Los Angeles TV and radio shows such as "Mid-Morning L.A." (KHJ-9), "The Mr. Blackwell Show", and "The Paul Wallach Show" on KIEV talk radio. Articles he has written, and those written about him have appeared in US News & World Report, The Huffington Post, Cover Girl Magazine, the Los Angeles Times, The Wall Street Journal, Parade Magazine, Variety, The Hollywood Reporter, The New York Post, The New York Daily News, The National Enquirer, The National Examiner, The Star, and The Washington Post. Both the Associated Press and CNN carried the news about the Garbo Interviews, in which Mr. Lozzi made public the information gained for his rare, exclusive and unprecedented interviews granted to him by the legendary film star Greta Garbo in 1981, 1983, and again in 1984. From 1990 to 1993, Mr. Lozzi was appointed as a West Coast Press Advance Office Aide in the George H.W. 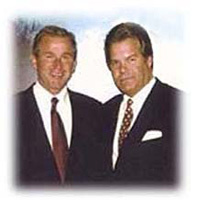 Bush Administration. Lozzi interacted with Press Secretary Marlin Fitzwater and other White House administrators. He helped choreograph monthly movements of the President and Cabinet members and the White House Press Corps during official trips on Air Force One. In 1997 Mr. Lozzi was chosen to be a judge for the prestigious Cable Ace Awards in the TV News Special category. In September of 1999, Mr. Lozzi was appointed Press Secretary to Sim Farar, the new United States Representative to the General Assembly of The United Nations, who was nominated by President Clinton and confirmed by the Senate. Lozzi was also the producer of the controversial Marty Ingels Show as heard on KIEV 870 Talk Radio in Los Angeles. Mr. Lozzi was nominated and then chosen as 2001-2002 Publicist of the Year at the cIrwin Awards for the Southern California Book Publicists Association. He is a member of the Academy of Science Fiction, Fantasy and Horror Films which produces the annual Saturn Awards ceremony in Los Angeles. In December of 2001, Mr. Lozzi was privileged to be mentioned in The United States Congressional Record by Congressman, and 2007 and 2011-12 Republican Presidential Candidate, Ron Paul (R-Texas) during hearings concerning proposed legislation that the US begin utilizing private forces to fight terrorism as Mr. Paul advocates. Click here to read the Congressional Record. In 2008 Lozzi joined the faculty of Loyola Marymount University's public relations curriculum as a part time guest lecturer. This program, as well as that at UCLA, is directed by the legendary entertainment publicist, Julian Meyers. In 2008 Mr. Lozzi was chosen to be a regular contributor to The Huffington Post. In 2011, Lozzi was approached by Condé Nast Publications to become a member of their Editorial Consulting group known as the Green Room. Condé Nast publishes mainstream consumer magazine publications such as Vanity Fair, Vogue, Wired, Glamour, The New Yorker, Allure, Architectural Digest, Self, and Condé Nast Traveler. Mr. Lozzi is divorced and is the proud father of his only child Brandon, who has recently moved from the Washington, D.C area to Scottsdale, Arizona. Mr. Lozzi is a member of the Los Angeles Police Department's Anti-Graffiti Task Force. In 2006, Mr. Lozzi was asked to be a consultant to the City of Beverly Hills Public Library, one of the finest in the country. Mr. Lozzi resides in Los Angeles and New York City.